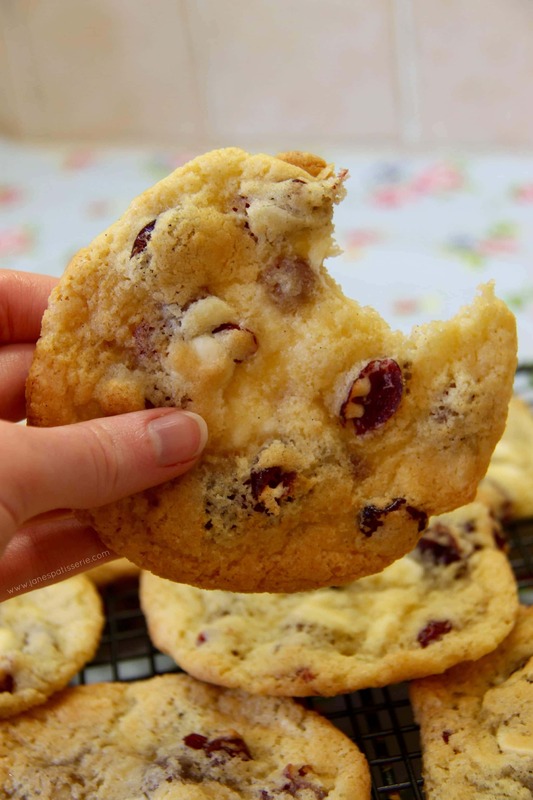 White Chocolate and Cranberry Cookies! Delicious Crunchy & Soft Cookies filled with delicious White Chocolate Chunks and Dried Cranberries – perfect with a Cuppa! White chocolate and cranberry is such an amazing flavour combination, so its not a surprise that you find it a lot in muffins in coffee shops (I always buy them). Its something you can so easily play with such as White Chocolate & Raspberries or even White Chocolate & Passion Fruit! I always believe in using the best ingredients that I can afford, but that doesn’t mean you have to go all out for every recipe that you bake! I sourced my cranberries from my local supermarket, and I buy my White Chocolate in bulk to make it cheaper – yummy. I have posted several cookie recipes in my time, but my favourite is my Chocolate Orange Cookies & Triple Chocolate Chip Crinkle Cookies – however, these both have cocoa powder in, and I realise not everyone is a fan of these types of cookies! This set me on my mission to create an utterly delicious recipe that doesn’t require chilling before baking! I posted a recipe similar to this when my blog first start, but I was never really a fan of how they looked, and even how they tasted so I decided to repost the recipe with my changes! 4) Carefully fold in the dried cranberries and chocolate! Other favourite combinations of mine is to used Dried Raspberries, or even put in 1/2tsp of cinnamon to make a delicious twist! Older Next post: Homemade Summer Berry Jam! Newer Previous post: Mars Bar Chocolate Mousse! These were regular, I would use 160/170C fan for these. All newer recipes state both temperatures required. Pingback: 11 Christmas baking recipes to make your Christmas sparkle! Every year around the holiday’s my mom makes these cookies. But, for the last couple years we have been using oatmeal mix instead of cookies. Both are delicious! Meant to say I’ve re-blogged it too ? This recipe sounds divine – I’m going to have to make these cookies for my hubbie ? Love this recipe – I’ll be trying it out, hopefully, over the weekend ? You’re a genius! I had not partnered these two flavor so before. ? They’re so yummy together! And thank you! !